Chickpeas, also known as garbanzo beans, are a type of legume that is full of protein, fiber, and complex carbohydrates. There are two varieties of chickpeas: the "blond" variety which is sold mostly in the Middle East and North America and the black chickpeas (also called Desi) found in India, Pakistan, and Ethiopia. Most of the calories in chickpeas come from carbohydrate. There are about 54 grams of carbs in a one-cup serving. However, many healthy eaters might reduce their serving size to one-half cup if they are consuming the legume as part of a larger meal. Most of the carbohydrate in chickpeas is fiber and starch. There is a small amount of naturally-occurring sugar in chickpeas. The glycemic load for a one-cup serving of chickpeas is estimated to be 23. There is a small amount of fat in chickpeas, although most of it is polyunsaturated fat—considered to be a healthier form of fat. There are also small amounts of saturated and monounsaturated fat in chickpeas. 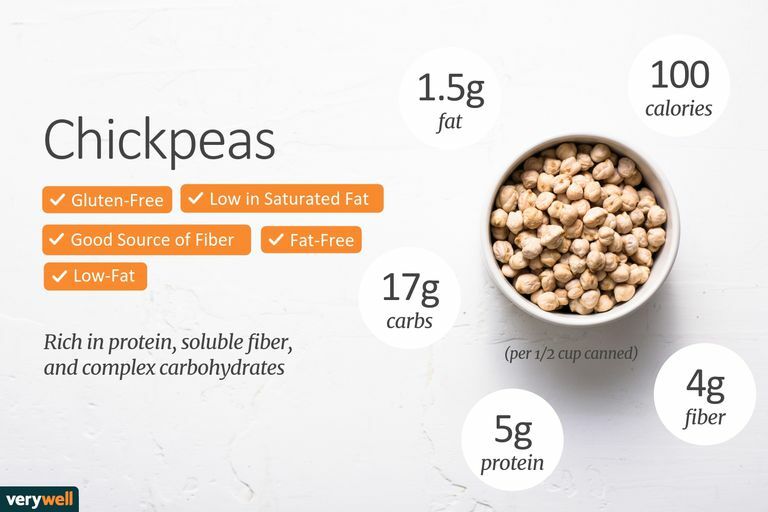 Chickpeas are a good source of plant-based protein, providing about 12 grams per one-cup serving. Protein is important in maintaining a healthy immune system. It is also the building block of hair, skin, and nails, and is used to help build muscle tissue. Chickpeas are an excellent source of vitamin B6 and folate. You'll also get a healthy dose of vitamin C as well as thiamin, riboflavin, niacin, and pantothenic acid. Healthy minerals in chickpeas include manganese, phosphorus, copper, iron, magnesium, and smaller amounts of potassium, selenium, and calcium. Chickpeas are an excellent source of fiber, containing 16 percent of your daily needs in one half-cup serving. About one-third of the fiber in chickpeas is soluble fiber, making it a heart-healthy food. Studies have shown that people who eat fiber-rich diets are at healthier weights and have a reduced risk of heart disease and cancer. Chickpeas, like other legumes, contain resistant starch that slows down the digestion of carbohydrates. Some resistant starch is not digested in the small intestine at all. At least one study has shown that replacing more rapidly-digested carbohydrates with legumes enhances glycemic control by improving insulin sensitivity in people with diabetes. Consuming foods high in resistant starch may also improve colon health, including promoting healthy bowel flora. Healthy eaters should keep in mind that canned chickpeas can be a cost-efficient and convenient way to add fiber and protein to your diet, but they are higher in sodium than dried varieties. One-half cup of chickpeas contains 280mg of sodium. To reduce up to 40 percent of the excess sodium, or roughly 110mg, drain and rinse the chickpeas thoroughly in water. What is chickpea flour? Is it healthy? You can purchase chickpea flour (besan), which is often used in Indian curries as a thickener. This type of flour has half the carbohydrates of wheat flour and is fiber rich. Chana dal is the split kernel of a variety of chickpea known as desi or Bengal gram. It has a sweet and earthy flavor and, when cooked, is about the size and shape of a corn kernel. It is one of the many legumes used to make dal, which forms the foundation of Indian cuisine. How many calories are in chana? One-fourth cup of dried chana contains about: 190 calories, 2 grams fat, 0 grams saturated fat, 0 mg cholesterol, 0 mg sodium, 560 mg potassium, 31 grams carbohydrate, 17 grams fiber, 1 gram sugar, and 11 grams protein. When cooked, one-half cup contains about: 126 calories, 1.3 grams fat, 0 grams saturated fat, 0 mg cholesterol, 0 mg sodium, 372 mg potassium, 20.6 grams carbohydrate, 11.2 g fiber, 0.66 grams sugar, 7.2 grams protein. How do I select the best chickpeas? You can purchase chickpeas dried or canned. When possible, purchase dried chickpeas because they contain less sodium than canned. What is the best way to store chickpeas? Store dried chickpeas in a cool, dark place. Once opened, place them in a tightly closed container. Canned chickpeas can be stored in a pantry or cabinet and are good until the best by date. Note that about one-fourth cup of dried beans yields three-fourth cups cooked. If you are using canned beans, simply drain and rinse before use. Chickpeas can be used to add to salads, soups, stews, chilis, casseroles, greens, or ​as an addition to grain dishes. Puree chickpeas to make hummus for dipping vegetables or whole grain crackers. If you are watching your carbohydrate intake be mindful of your portion of chickpeas as they are carbohydrate-rich. Combining pureed chickpeas with tahini yields hummus. Today, there are so many varieties of hummus ranging in color, flavor, and calories. Using more tahini produces hummus that is lower in carbohydrates and higher in calories. Use hummus to dip vegetables for a protein and fiber-full snack, or swap high-fat condiments (like mayonnaise) for hummus when making tuna or chicken salad. According to medical sources, legume allergies used to be fairly rare but have become more common in recent years. In fact, allergies to lentils and chickpeas are now a common cause of food hypersensitivity in Mediterranean, Middle East, and some Asian countries. The American Academy of Allergy, Asthma, and Immunology suggests that an oral challenge performed by a qualified medical professional is necessary to determine if you have an allergy to chickpeas or other legumes. Aguilera Y, Esteban RM, Benítez V et al. Starch, functional properties, and microstructural characteristics in chickpea and lentil as affected by thermal processing. Journal of Agricultural Food Chemistry. 57:22 (2009) 10682-8. Labensky, SR, Hause, AM. On Cooking: A textbook of Culinary Fundamentals. 3rd ed. Upper Sadle River, NJ: Prentice Hall, 2003: 632-633.